It is important to be able to change guitar strings properly. There are even professionals who have been playing guitar for many years that sometimes fall into the pitfalls of changing their guitar strings improperly. I'm going to share with you the tried and true method of changing the strings on your precious instrument in a few easy steps. Included on this page is a video tutorial to help guide you each step of the way. 1.The first step is to lay the guitar on a flat work space (a table or stand). This makes it easy to do your work. 2. 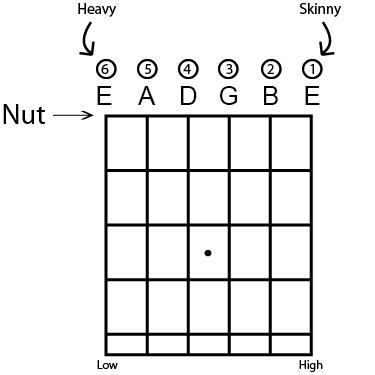 Loosen and remove string number six ( E string: see diagrams below). Under normal tuning it is best to remove and replace the strings one at a time, unless you plan on cleaning and polishing the neck. Replacing each string one at a time helps keep the neck tension regular and keep things like a floating bridge or tailpiece parts in place. 3. Replace string after removal. 4. Wrap string around peg for wound strings at least once (usually strings 6 E, 5 A, and 4 D and sometimes 3 G for thicker gauged) counter clockwise before inserting end of string in tuning peg hole. 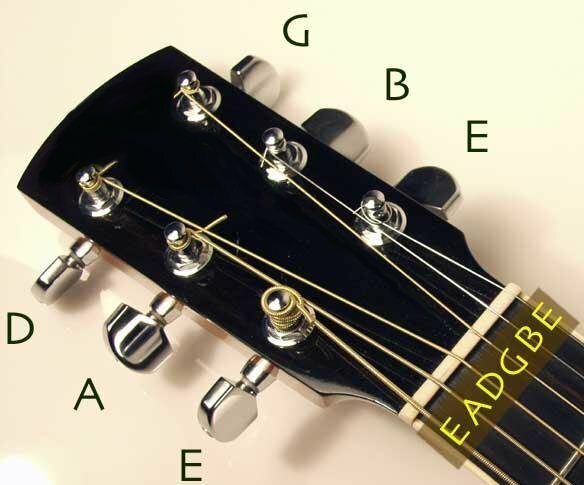 If the pegs are divided on the neck (See diagram below) then you would wind them clockwise for strings 3 G,2 B and 1 E. The unwound strings would need to be wrapped around the tuning peg at least 3 to 4 times before inserting the end of the string in the hole. 5. Tune the string, then use a string stretcher on the string and re-tune. (see video). New strings have a tendency to loosen quickly and have to be re-tuned unusually often. So stretching the string helps the string adjust so as not to have to be re-tuned as often. 6. Cut string with wire cutters. It is recommended that for the wound strings that a right angle bend be made before cutting. This helps insure that the string will not unravel. This is not necessary for unwound strings. 7. Repeat Steps 2-6 until all strings have been replaced. I've tried this method just recently and I like it. Like many musicians who have been playing for a long time I was using other methods, but I found this to be quite an improvement over what I was accustomed to doing throughout the years. Hope these tips will help the beginners in learning how to replace your strings and professionals who need to improve their guitar string replacing habits. Deliverance Music provides award winning quality music performances and lessons.